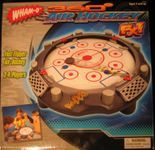 360 Air Hockey, 2007, Wham-O. This is a battery powered small (14") circular air hockey table that can play 2,3, or 4 players. Has all five hockey pucks, set of batteries, and runs fine.